The Angriest: Doctor Who: "A Christmas Carol"
It's 25 December 2010, which means it's time for the fifth Doctor Who Christmas special. A passenger space liner, whose passengers include Amy (Karen Gillan) and Rory (Arthur Darvill), is set to crash onto an isolated human colony. Its only hope is for an artificially generated cloud layer to be deactivated, but the only man that go do it is the miserly Kazran Sardick (Michael Gambon) - and he has no intention of saving anybody. It is up to the Doctor (Matt Smith) to change his mind. Doctor Who traditionally hasn't used time travel as anything more than a convenient method to get the Doctor and his companions from one adventure to the next. When Steven Moffat started writing for the series that approach started to change. When writing for executive producer Russell T Davies, scripts like "Blink" and "Silence in the Library" were built around time travel. When Moffat assumed producing duties himself, his entire first season became wrapped around time travel and paradoxes. 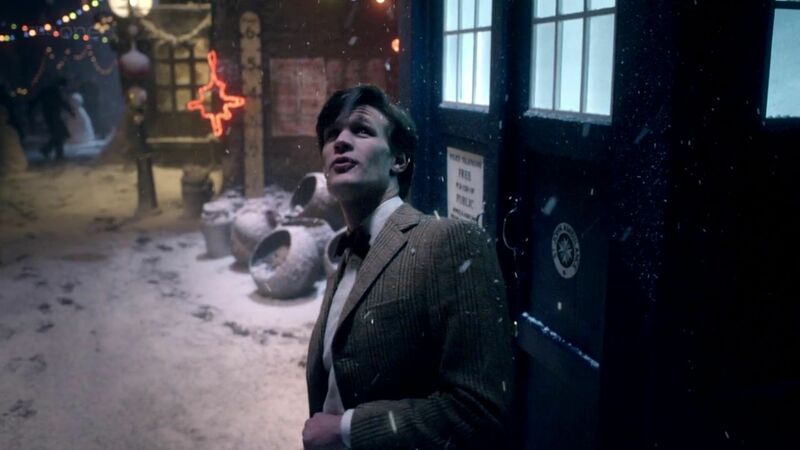 This focus on the story potential of time travel continues in Moffat's first Christmas special, in which the Doctor actively and repeatedly changes history to save the day. Back in the 1990s, Steven Moffat's first professional writing for Doctor Who was a short story for one of Virgin Publishing's Short Trips anthologies. "Continuity Errors" saw the Doctor incessantly travel back in time to change the life of a specific librarian, so that eventually that librarian would be a nice enough person to let the Doctor borrow a book and use it to save some distant threatened civilization. The story was told from the point of view of that librarian, their entire life unknowingly changing around them, and it was essentially played for laughs. "A Christmas Carol" plays out, comedic moments aside, as a heartfelt drama. A spaceship is about to crash. The only man who can save it refuses to do so. The Doctor has a time machine, and therefore sets out to change that man's past: not just to transform him into someone that will allow the spaceship to land without loss of life, but to actually make that man a better person. To tell that story Moffat adopts the broad structure of Charles Dickens' "A Christmas Carol". Kazran Sardick is indeed met by three ghosts - of past, present and future - but in a typically Moffat-style twist it is the adult Sardick himself that acts as ghost of the future to his own child self. As if that wasn't enough, Moffat throws in a few additional strange elements, like sharks that swim through the sky and a beautiful young woman frozen in a box. The fairy tale elements that infused Season 5 continue to dominate here. It's one of the most storybook Doctor Who episodes ever devised. Michael Gambon is a natural choice to play Sardick, Doctor Who's science fiction version of Ebenezer Scrooge. Lawrence Belcher gives a wonderful sort of wide-eyed and charming performance as Sardick's younger self. Casting singer Katherine Jenkins is a stunt, but she still delivers a capable and delightful performance. That's the thing about this episode: it's just a wall-to-wall delight. When the more serious moments hit they're all the more effective due to how enormously charmed the audience is. Director Toby Haynes does a great job with a wonderful script. Matt Smith is tremendous, and fully settled in as the 11th Doctor. While Amy and Rory barely get a look-in, you wind up not really minding because what you receive instead is simply so good. In my opinion it's the absolute best Christmas special the series has generated to date.